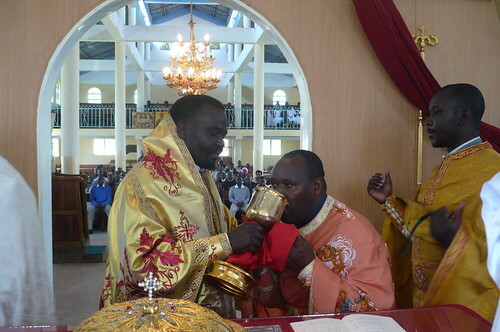 OCMC News - American Clergy Come Through for Kenyan Bishop! You Can Too! It can be a struggle for His Grace Bishop Neophytos to financially support the priests of the of the diocese of Nyeri and Mount Kenya. Your gift to the Support a Mission Priest (SAMP) program can help His Grace to care for the Orthodox clergy in his diocese. The 57th Assembly of the Diocese of the Midwest was held in Lansing, IL, October 8-10, 2018. His Grace Bishop Neofitos of the Kenyan Diocese of Nyeri and Mount Kenya joined the clergy and faithful at our Assembly. During Bp. Neofitos’s presentation to the assembly, His Grace shared some of the challenges that are faced in the diocese. The Diocese of Nyeri and Mount Kenya is in a rural and agricultural part of Kenya, north of Nairobi. One major challenge the diocese regularly faces is how to support the clergy, and one critical need is that of medical care. To illustrate, His Grace shared a recent event with the Assembly. Papadhia Rispher Muchuku is the wife of one the priests in the diocese. After suffering from medical problems for the past 10 years, doctors recently discovered the source of her ailments. It was determined that she needed what amounted to emergency surgery. She is a mother of 4 and doesn’t work outside their home. Unfortunately, there is no health insurance available to the clergy there, so they brought their problem to His Grace. He told them to go get the surgery, and that the diocese would pay for it. His Grace shared that there is little in the treasury of his mission diocese, but he couldn’t say no to this need. The surgery ended up costing $3,000 (US). He shared that he will always offer whatever he has to care for the flock that is entrusted to him. As His Grace took his seat, someone from the Assembly came to the microphone and suggested that we take a collection right there at the Assembly. Through the generosity of those gathered at the Assembly, a generous gift of $3,387 was made to the diocese of Nyeri and Mount Kenya! Papadhia Rispher’s surgery was paid for and a little more. A heartfelt thanks goes out to the Diocese of the Midwest from the Diocese of Nyeri and Mount Kenya. This generosity is very inspiring, and I pray that we in the Church can always continue to express our unity and support Orthodox clergy in the mission field. Please prayerfully consider helping the priests ff the Nyeri Diocese, and around the world, with a gift to OCMC's Support a Mission Priest (SAMP) program.